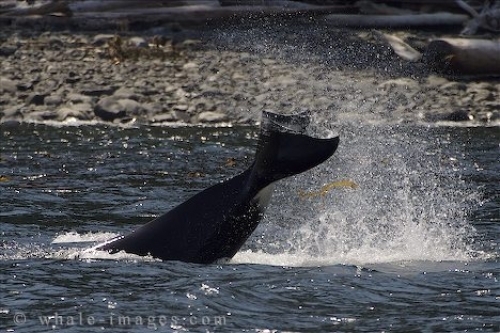 A Killer Whale flicks kelp in the air with its tail in British Columbia, Canada. The Northern resident Killer Whales spend around five months of the year in the Johnstone Strait area off Vancouver Island foraging for food, interacting with each other and playing. A typical habit of a killer whale is swimming amongst and playing in the kelp beds where they get it wrapped around their tail flukes. They are often seen flicking the kelp in the air off their tail. This frisky killer whale was having a great time in the kelp doing what looks like handstands with its tail in the air then slapping the water and making a big splash. The tail of a killer whale is black on the top side and mostly white on the under side, fringed by black. Here is a list of various whale tail pictures featuring killer whale tails, humpback tails, and tails of Sperm Whales. Picture of a killer whale playing in kelp with its tail near the shoreline of Vancouver Island, British Columbia, Canada.